Break out your sequins and fringe, because Dancing with the Stars is back! After a fun night of cha-chas, waltzes, and more, audiences got their first impressions of the season 24 cast. Resident dancing queens Maddie, Megan, and Chelsea discuss the best, the meh, and the cringeworthy from week one of the competition. THE BEST: Which performances did you enjoy most? Maddie: I’d have to say that Normani and Val really impressed me. I was not expecting that level of dance ability from her. She and Val have a really fun dynamic. The quickstep is not easy, especially is sheer lace. Normally, big twirly dresses can mask some of the footwork. Unsurprisingly, the musicality in her movements was superb. I look forward to seeing her grow. Simone and Sasha were a delight, but I look forward to seeing her grow and really get into the character of the different dances. Then again, that's why I don't like that the show gave them tango for the first week. I miss the earlier seasons where the show had a strict schedule for when each dance style happened. I can already tell that Heather and Maks’ pre-packages are going to be hilarious. Although I do side-eye that Heather tried to cite being a mom as a reason her edge over other contestants isn't as vast as it is. That argument makes about as much sense as a Bruno Tonioli metaphor. Their waltz was lovely. Personally, I would like to see more emoting in her facial expressions while dancing. It's something that's bugged me since Glee. 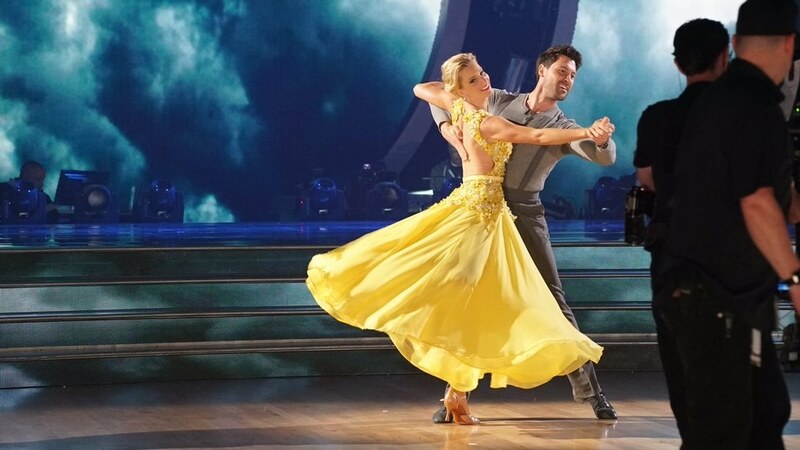 I'm just hoping this is the year that Maks finally gets his choreography Emmy nomination. Rashad was the biggest surprise. First, he is charming beyond measure. He and Emma are going to be so much fun. I'm glad they finally gave Emma a partner with some natural dance ability. He still needs a bit of polish, but I can tell by week four we will have some truly amazing routines from these two. If there's any hope of a guy in the finale, it's him. Megan: I loved Erika Jayne’s because I’m such a fan of hers. I LOVED hearing “Go, Cubs, Go” on a ballroom dancing show. Rashad Jennings was such a huge surprise for me, just as Normani was since I’ve seen Fifth Harmony live and the choreography was less than ideal. Heather Morris was beautiful (was she going to be anything else? ), and I just had the most fun watching Charo because she has more energy than I do and I’m 27. Chelsea: We all know I am here for my Olympians, and I had no doubt Simone would CRUSH it. She and Sasha work so well together (and their Snapchats at rehearsals are adorable). Much like Laurie during last season’s premiere, they saved her for last to close out the night on a high note. The question is, can she keep it up and have her fans rally to vote? My other Olympian, Nancy was also great, though so much more subtle in her performance. I look forward to seeing her grow and h,ave fun on the show. She’s just so elegant to watch. Behind Simone, Heather was my favorite dance to watch and it’s already clear that the judges are going to be TOUGH on scoring her. Sometimes I just need to watch a really well-performed routine and the girl always delivers. I don’t know where Rashad came from but from moment one, I knew I had underestimated him. What a beautiful surprise we have here, and how great is it that Emma and Sasha had the top two dances this week? Girl needed a good partner and finally got it. THE MEH BUT ENTERTAINING: Which performances did you still find entertaining and were charmed by even if the level of dancing was not there? Maddie: Like Megan said, Charo’s energy is more than I have ever had in my life. She is infectiously fun. I don't really see her doing well with the more low-key ballroom styles, but she sure is fun to watch. I am obsessed with Erika now. I'm not sure if her dancing will ever match how awesome her pre-packages will be, but she may surprise us. Nancy Kerrigan was perfectly lovely, but I am not wowed as of yet. However, I do need to take a second to express how Artem riding in shirtless on a Zamboni may just be my favorite pro-intro ever. Weirdly enough, I was thoroughly charmed by Nick. He was more likable in this than any episode of the Bachelor franchise he's ever been in. He and Peta’s partnership strangely works well. Bless his heart, the boy is trying. It was actually kind of endearing. Megan: Chris Kattan. I think it mostly has to do with the fact that I just enjoyed his characters so much and they played off of that because the moves weren’t as great as they could have been. But I absolutely love Witney, I have since she was on So You Think You Can Dance, and I think her and the whole thing just was so entertaining despite the lack of technicality. The same goes for Mr. T. He was off toward the end, but if he sticks around, he’s going to bring me to tears. I just know it. Chelsea: Maddie, don’t let Nick fool you. He’s done this A LOT and he looked so fake trying to be fun and free-spirited. He has the confidence but not the execution. I found Chris Kattan to be so much more fun even though he was a terrible dancer. Younger me watched that Roxbury movie every single day and I have such fond memories of him on Saturday Night Live. I want to see him improve and I don’t think the judging was super fair on that one. Charo and Erika Jayne were a lot of fun to watch and I love their positive energy. This kind of glitzy and slightly ridiculous show is right up their alley and they know how to work the crowd. I cannot wait to see more of them this season. THE CRINGEWORTY: Which performances did you least enjoy? Consequently, who do you think is going home first? Maddie: Saying this right now: I do not like the cowboy. The show is trying to get us to think he's a heartthrob, and that there'll be some kind of showmance with Sharna but I am not impressed. He acted smug and full of himself, and that stilted cha cha did not back his claims up. Boy, bye. The Cubs player and Mr. T were really likeable but the actual routines were kind of painful. I need Mr. T to stay at least to Disney Night. He's amazing. I'm thinking Chris is going to go. He's the type of funny that when the joke doesn't land, it's kind of awkwardly uncomfortable... which is also a good descriptor for his dancing. He's also not a big enough name to make up for his scores. I have no clue who his voting base would be. Megan: I don’t want to say this, but I feel like Chris Kattan is going to be one of the first to go. He got a super low score and just wasn’t totally focused on the dancing. Other than that, I seem to not really have a firm grasp. Sure, there were others that didn’t do as well, but I feel like we want to see them stick around and continue on. Nancy Kerrigan was a bit of a forgotten number for me, so that could play in as well. Other than that, I didn’t really feel like anyone was horrible to watch. I love the first week because generally everyone is on the same level playing field with their experience. Everyone makes mistakes and fumbles and that’s totally okay. I’ll be eager to see who goes home next week. Chelsea: I agree with Megan in that it was a really good first week. It PAINS me to predict Chris leaving but I have to be realistic. I want him and his brand of awkward humor to stay forever but I don’t see it happening. I don’t like the cowboy and it kills me Sharna is partnered with him. Can we just bring James back for her? They were so much better together and she is due for a win! I think she would’ve been better off with someone like Nick so Peta could have more of a maternity leave (you cannot convince me she just had a child and is dancing like that and looking that great #superwoman). I think Nick will be the Ryan Lochte producer pick this season and stick around long enough to appease the other Monday reality show producers. Nick has been consistent for ABC and they have a lot invested in him. I don’t remember Mr. T dancing and that’s not a good sign for him. Hopefully he leaves more of an impression next week.